THE BRILLUSTRATOR: The Golden Tooney! I can't believe I forgot to blog about this! My apologies for being stupidly out of touch lately! 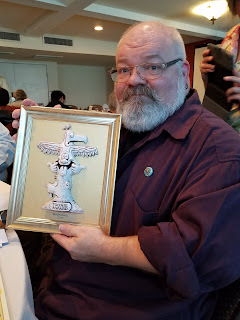 Back in May I attended the Cartoonists Northwest Tooney Awards. Cartoonists Northwest is a cartoonists group based in Seattle that has been around for more than 30 years! It includes many really wonderful artists and comics creators from all around this area and although I have only been a member for a few years now, I've known about them and have been friends with many of its membership for a decade or more! Every year they honor individuals amongst the membership rolls for their work during the previous year and this year I was nominated for an award for the first time! Someone nominated my "14 Doctors" Doctor Who caricature piece in the illustration category. I was very excited when I actually won the award at the banquet! But I was further and VERY surprised a bit later when they announced me as the winner of the Golden Tooney Award, which is sort of the "Artist of the Year" award! I was really honored and just really happy! 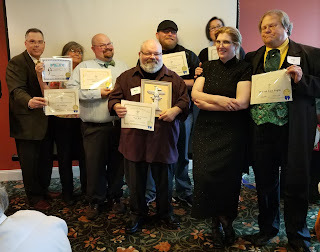 I get to join the ranks of past winners like Phil Foglio (who was present to MC the gathering), Mark Monlux, Donna Barr, Roberta Gregory...well, the list is a long and amazing one! It's a lot to live up to. 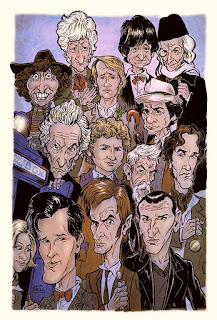 I'm just going to post a couple of the pics taken at the event and the "14 Doctors" piece that got the nod in the first place! And I just want to say thank you again to everyone at Cartoonists Northwest for giving me a truly memorable, wonderful day!